Annie Inez Stanford is 91 years old today, born in 1920. Annie is the boys' 2nd cousin 3 times removed. Her father is Asia Minor Stanford their 1st cousin 4 times removed. Asia's father is Jacob K. Stanford and Jacob is the brother of 3rd great-grandfather, David Stanford. John Davis McCutcheon and Lenore Overstreet's 137th anniversary is today, married in 1874 when he was 20 and she was 14 years old in Morgan county, Alabama. This couple is Steve's 3rd great-grandparents. They begot Lula May McCutcheon in 1887. Lula married Samuel Omar Garrison in December of 1905. Pamelia Phillips died 103 years ago today in 1908 at age 98 in Peterburg, Rensselaer, New York, USA Pam is the wife of the boys' 4th great-granduncle, David Bradley Banks, the 1/2 brother of Samuel Cheney Cotton via their common mother Sally Gold. Prudence Denison is 293 years old today, born in 1718. Prudence is the boys' 3rd cousin 9 times removed. She was born and died in Stonington, CT. Her father is Daniel Denison, the boys' 2nd cousin 10 times removed. Daniel's mother is Phebe Lay from Saybrook CT, the boys' 1st cousin 11 times removed. Phebe's mother is Sara Fenner from Horley, England the boys' 10th great-grandaunt and sister of Phoebe Fenner born in Watertown, CT in 1633 and married William Ward March 28, 1669 in Middletown, CT. They are the boys' 10th great-grandparents. Ruth Snow died 295 years ago today in 1716 at age 72 in Eastham, Branstable, Massachusetts. Ruth is the boys' 10th great-grandaunt, the sister of Sarah Snow both born to Nicholas Snow and Constance Hopkins who we talked about the other day. Sarah Snow is the boys' 10th great-grandmother who married William Walker in 1655. Claude Edwin Hambrick and Carolyn Barnett Meyer's 60th anniversary is today, married in 1951 in Atlanta, Ga when she was 22 years old. Caroyln is the kids' 3rd cousin twice removed and their 5th cousin 3 times removed. Her father is Arthur Herman Meyer, 2nd cousin 3 times removed whose father is Dedrick Hammond Meyer, 1st cousin 4 times removed, whose father is John Hammond Meyer, the brother of 3rd great-grandfather, Dedrich Henry Meyer. Mary Jane Stewart died 44 years ago today in 1967 in Oglethorpe, GA at the age of 88. She is the wife of 1st cousin 4 times removed, John B. Meyer, whose father is the aforementioned John Hammond Meyer the brother of 3rd great-grandfather, Dedrich Henry Meyer. 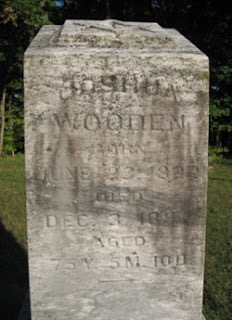 Joshua Hugh Wooden is 129 years old today, born in 1882. Josh is the boys' 1st cousin 4 times removed. His father is Joshua Miller Wooden, the brother of 3rd great-grandfather, Andrew Jackson Wooden.